And I thought the Intrepid was a bit large. 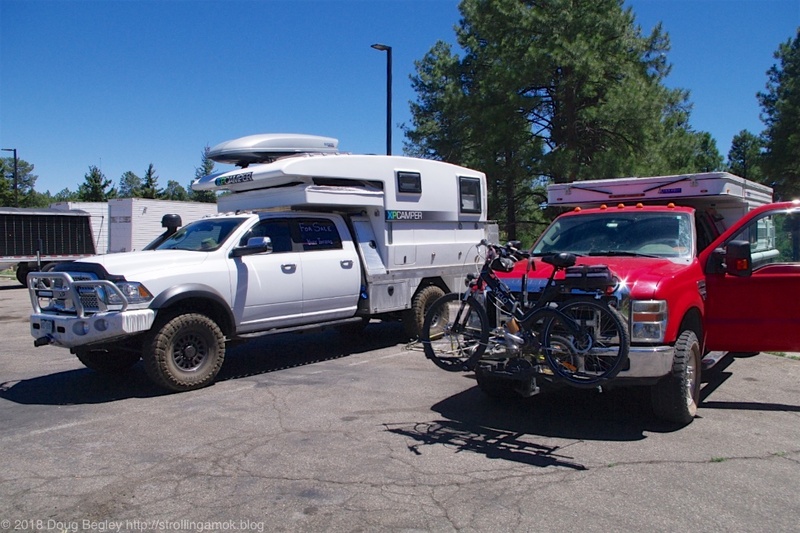 This Dodge Ram with XCamper was in the Little America Truck Stop in Flagstaff. It’s for sale, and no doubt they too are headed for the Expo. 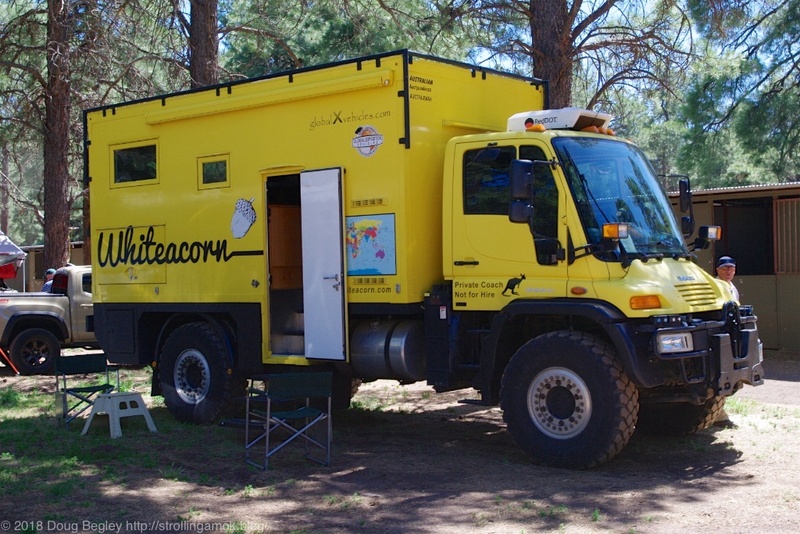 Errand day went fine in Flagstaff, at least until I finished and parked in a Conoco lot north of town on US-89. 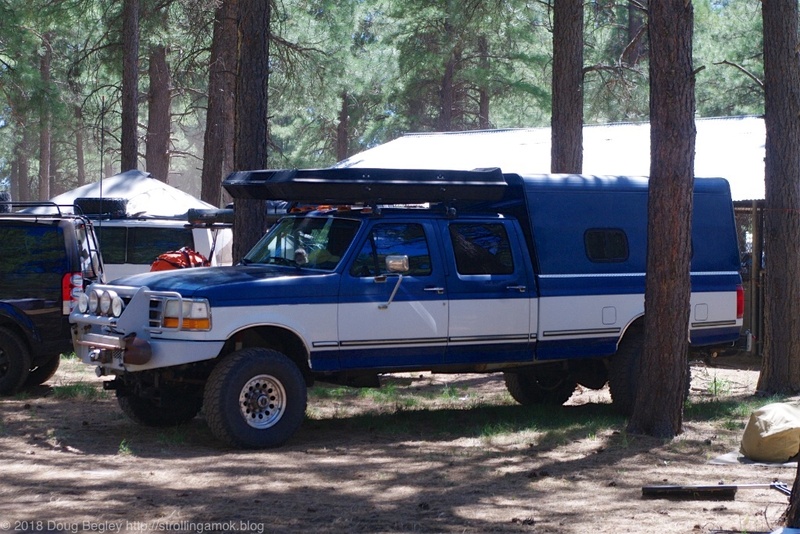 A local fishing guide stopped by to ask about the Four Wheel and how difficult it was to lift the roof, so while his small child slept in his SUV, I explained the standard setup, explained the Grandby’s optional setup to support the old-school framed solar panels on it, then put him to work to lift the rear up. “Oh! That’s not bad at all!” he said, being young and fit. During our conversation, he told me that he grew up in Flagstaff and lamented the complete change in aura and events, going from lumberjack contests to politically correct eco fare. It’s always painful when a town loses its authenticity and differentiation, which in this case he blamed on transplants from Californistan. Right after he took off, a guy pulled up and wanted to know if I’d like a TV. He had a smallish television and antenna that he claimed would pull in a station 35 miles away. Now, I desire to watch television about as much as I love going to cardiologists and dentists, so I politely declined. I was tired and figured a nap was in order, but the highway noise and prospect of dealing with overnight shenanigans at a gas station motivated me to find better, so I quickly put the roof back down and departed for points north. A Cinder Hill OHV area boasted of camping, but a sign near the entrance I took said no camping, so I headed for the Schultz Pass area where I’d stayed before. Little did I know that another nearby entrance detailed the camping issue, which was to limit camping to the OHV area proper. I visited it on my way back the next morning, and such a vast acreage of black cinders I’ve never seen. I wound up in a tidy little spot deep in the woods. I returned to see what Cinder Hill was like because I needed an area where I could spend the morning cleaning out my CPAP tank and hoses, additionally getting the batteries as charged as possible for the upcoming scarcity of sunlight at the Expo. It seems that liquid Castile soap was a very poor choice to substitute for dishwashing liquid, since it not only coated everything with a slimy film, but congealed into white lumps that stuck to everything. Even a redo with Dawn had only a limited effect. So I gots me a sizable bottle of isopropyl alcohol, cotton balls and Q-Tips on my errands, and worked on it all in a large dish tub I have. It seems to have since evaporated nicely and the alcohol scent is gone, so I may have a working system tonight. I got to the Expo to join in on a long lineup of early arrivals, which started moving at 1 PM. 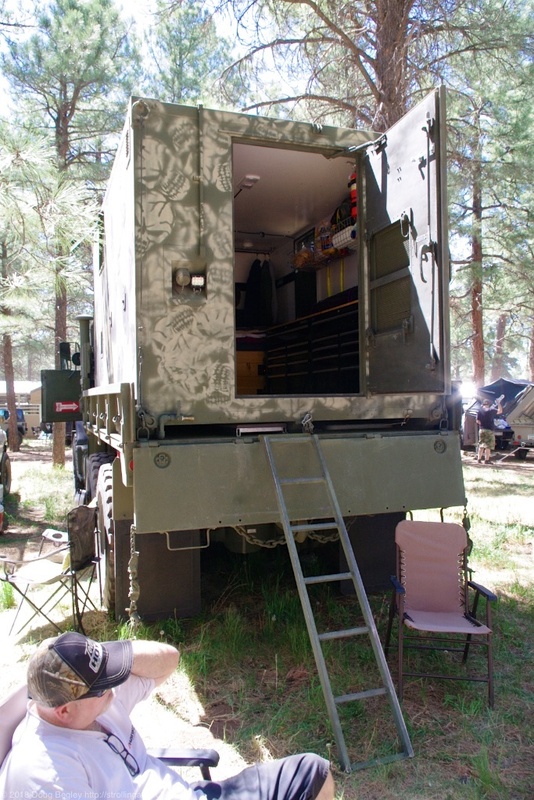 It took about 45 minutes to get into the dispersed camping area, and I wedged the Mighty Furd into a slot almost big enough to fit it. It’s intimate, but tolerable. A nicely detailed old Ford is fitted with a shell and who knows what in front of it. My next-door neighbor is sporting the most unusual travel trailer I’ve seen, and the name made me assume that it must be Australian. 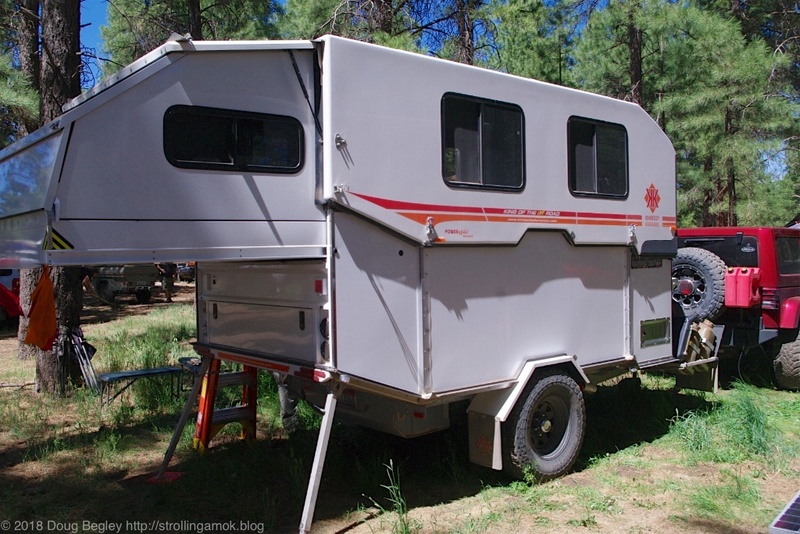 They’re much more serious about overlanding than we are, and this rig shows it. It raises in height like an Alaskan, but unlike an Alaskan, the hardside bed area extends out to make for a much larger living space. Compacted for travel, it’s quite small and low to the ground. My neighbor had it shipped in from Australia in a shipping container, and the company’s owner then arrived to check it over and show this guy how it all works. Front to back, it looks very well thought out and likely to hold up well. Unfortunately, his MPPT solar charger just bit the big one, so he’s on generator power until he can make some arrangements. He’s towing it with a Jeep, so it must be pretty lightweight. So what is it? See for yourself. 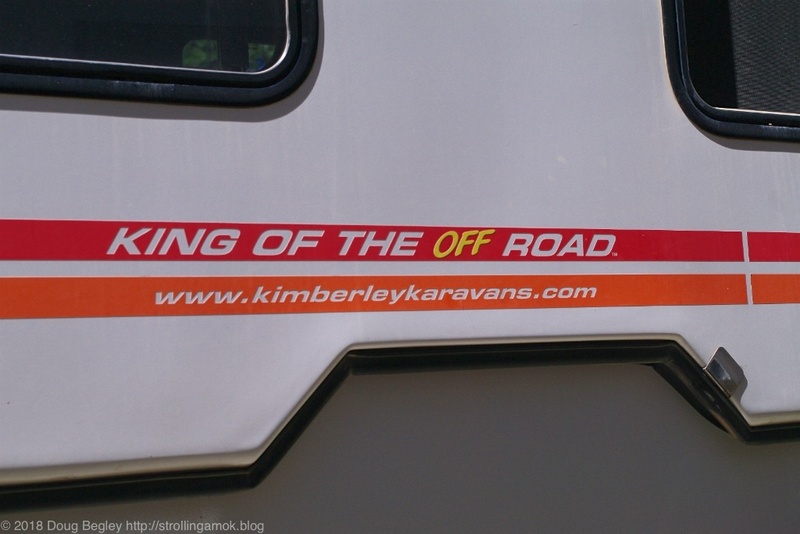 The Brits and Aussies use the term “caravan” instead of travel trailer, but Kimberley apparently couldn’t resist that klassy respell, a la 1955. 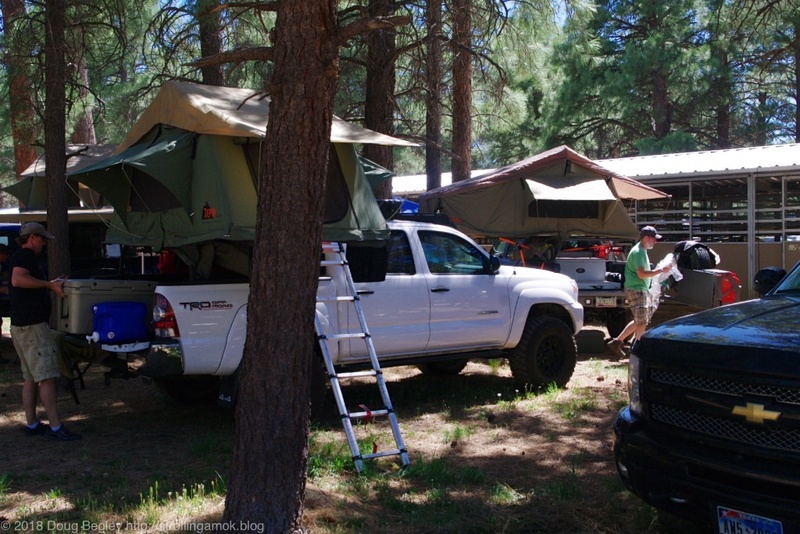 Plenty of rooftop tents here, as well as ground-based ones. One of several Big Boys present. This one may look like a delivery truck, but it’s articulated frame and high stance allow it to clear very large obstacles. 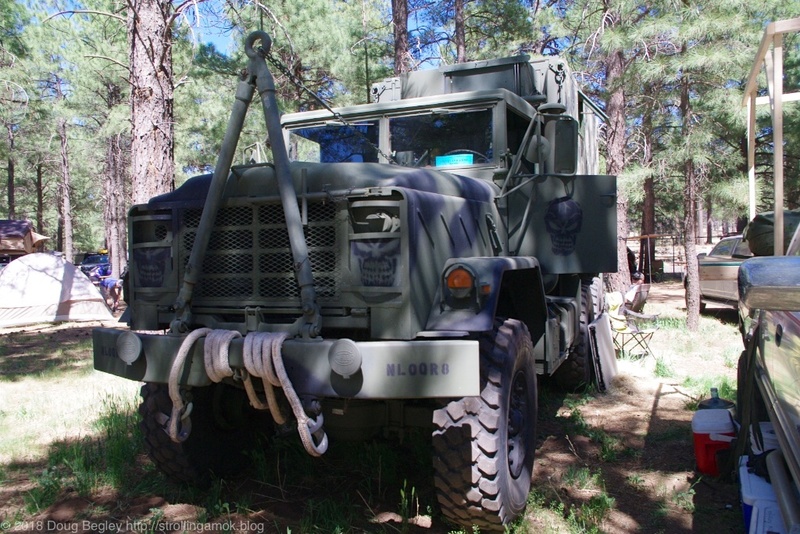 This old military truck carries a cargo box on its bed. I asked the owner what could possibly tow such a vehicle, and he replied, “My other one just like it.” Saucy fellow, that! Glamping, it’s not. It’s been retrofitted with lighting, a bed of sorts, and a wall of tool storage drawers. Watch out for that first step, it’s a lulu! The Evelo e-bike chose my arrival to once again develop a flat front tire, and that’s after a self-sealing tube was replaced. So I’ll make inquiries in town about whether another Serfas Drifter tire might be in stock somewhere, as well as an extra thick Slime tube. In the meantime, there’s little point in taking the time now to fool with it, since there’s little downtime for such things here. It ran flat less than a half hour after I filled it, which is the game changer. The only tubes I have on hand are standard, and there’s obviously something embedded in the Michelin tire that’s the real problem. Looks like I’ll be taking the shuttle to and from the display grounds, which takes a half-hour. This being my last year of attendance at this event, I can assure you that my coverage of it will be comparatively sparse. The lack of a bike and trailer means less mobility to get to certain demo areas in a timely way, as well as limiting what I can carry. I’d also like to enjoy the event, and covering it as some sort of pseudo-media coverage interferes with that. It will be difficult enough just staying hydrated. The weather will likely be perfect, however, so at least one of us will enjoy this thing!